Travelling can be seen as a sequence of images as in a film, discovering new landscapes, new people, new music, new dishes… but it is also a succession of emotions. Umbria is a province of Italy which has remained "in the shade"*, in obscurity because it has neither famous cities of art like Venice, Florence or Rome, nor famous beaches like Rimini, La Spezia or San Remo, and thus is little known to tourists. It is a mountainous area with medium-size towns, the most famous being Perugia with its universities and Asissi, where St Francis, who founded the order of the Franciscans, was born, and which attracts many Christian visitors. Umbria is also a gastronomic region with specialities like salame, wild boar and truffles, as well as excellent wine like Montefalco, but unfortunately, it is also an earthquake area. You may remember the 1997 earthquake which damaged the basilica of Assisi, and last August Umbria hit the headlines once again because of a terrible earthquake with a 6,2 magnitude on the Richter scale, which completely distroyed the village of Amatrice killing more than 240 people, the total population being 1046. Mother Nature can sometimes be even more cruel than humans themselves. We were in Umbria some ten days before the earthquake. 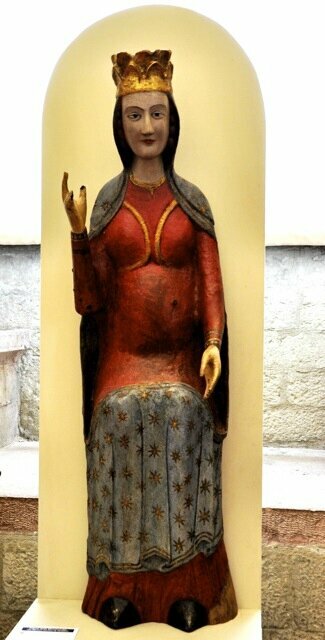 There are there two medieval towns where we like to spend the night before we embark for Greece from Ancona. One is Urbino, whose cathedral was damaged in the earthquake, the other is Gubbio where we stopped this year (fortunately Gubbio wasn't harmed). Medieval Gubbio was built on a mountainside, overlooking the modern town below. In the Middle Ages Gubbio was a free commune under bishop rule from time to time, until it gave itself, at the end of the 13th century to Duke Montefeltro of Urbino to escape from the bishop's armies. It was then that the Palazzo dei Consoli (the Consuls' palace)was built, which houses a museum today. In the Palazzo dei Consoli you can see the Eugubine Tablets, seven bronze tablets inscribed in the Umbrian language in two alphabets: the oldest texts in the Etruscan and the most recent ones in the Latin alphabets. The tablets were inscribed between the 3rd and 1st centuries BC but they take up much more ancient texts, dating back perhaps from a thousand years BC. Umbrian is an Italic language from Indo-European origin like Latin. 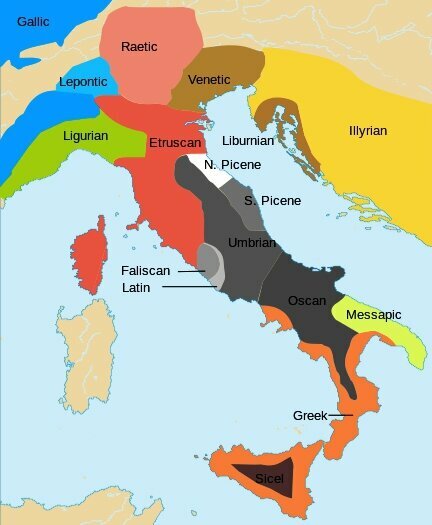 The Umbri arrived in Italy in the 2nd millenium BC; they were the oldest Indo-European population there, and were driven back from the north by the Gauls and out of Tuscany by the Etruscans before they were conquered by the Romans. How strangely familiar do these words seem to us, although we cannot understand them ! How moving it was to see those texts in such an ancient Indo-European language, engraved on bronze in their strange alphabet and even more moving to hear them on recordings, which were undoubtedly not made 300 years BC ! On the top floor the Palace houses the pinacoteca. There, in addition to splendid ceramics which have been a tradition in Gubbio since the 14th century, you can admire exceptionally beautiful frescoes and tempera paintings on wood panels from the 13th, 14th and 15th centuries. Some of them are just as superb in their simplicity as Byzantine icons, but perhaps the most moving artifact was a naive 14th century pieta, which strikes you with its expression of pain and dispear. On the embarkation in Ancona and the crossing to Igumenitsa, there is little to say, except that the boat was full of people from all nationalities: Italians, Germans, Greeks, Turks, Slovenes, French and English people, Europe in miniature. However, as I had often observed, they have absolutely no communication with each other: they only use a basic English to order meals or buy things; the Greeks of course spoke Greek and the Italians Italian. On our arrival in Greece, we were warmly welcomed by Isabelle, my Greek teacher, in Platamon at the foot of Mount Olympus, in the house her father, a famous Greek sculptor, had built. In Afissos we were happy to meet our old friends Yanis and Marina, Elisavet his sister from Mytilene - an excellent cook - and her two daughters, as well as Kostas and his daughters, the Little Mermaids (οι Μικρές Γοργόνες). The eldest one has just finished her studies as a nurse and is now starting a 6 month training period in Athens; then, as it is practically impossible for young people to find work in Greece, she is planning to go to Ireland. We also saw Stavrula and her children in their tavern ο Γλάρος (the seagull), and met Stavros who keeps another tavern on the sea-front and is very friendly. Wie schnell vergeht die Zeit, How fast does time fly ! On the beach we met Helena, a young German, from a 5 children Bavarian family we had known for a long time. The last time I had seen her, she was 17; she is now 29 and a sports and geografy teacher on Lake Constance in Austria. All the children who used to play with my daughter are now adults, like the Little Mermaids and Elia, a young Greek who has become a dance teacher. I had a talk with Elia's mother, a primary school teacher, about the economic and political situation in Greece: "It's far worse than last year" she said, "especially for young people who can't find work. The rich get richer and the poor poorer. They want to crush the lower-middle class". She added: "Europe has forgotten its real values, human values". The owner of a bar on the beach, where my daughter used to eat sandwiches, agreed: "We adults, will survive, but in this country there is no hope for young people, and this is terrible! What does Tsipras want ? We don't understand". He insisted on paying for my coffee - "in memory of your daughter", he said. It is one of the oldest museums in Greece, that was renovated in 2004 and in a very pleasant, lively and warm atmosphere, displays objects, ceramics, statues, weapons, jewels, funerary stelae from the Neolithic, Hellenic and Roman periods. Most inpressive are the ceramic female figurines known as psi and phi figurines because they are shaped like those Greek letters. Those figurines together with other pottery, vases, etc. date back to 5000 - 4000 BC, a long time before the first Indo-Europeans, the Achaeans, arrived in Greece around 1900 BC. Did those potters belong to the Old Europe culture, described by Marija Gimbutas, and whose populations worshipped the the Mother Goddess whom the figurines seem to represent ? In any case, I was struck by the fact that the geometric patterns on the pots were very similar to those found by David W. Anthony in the kurgans of southern Ukraine and Russia. 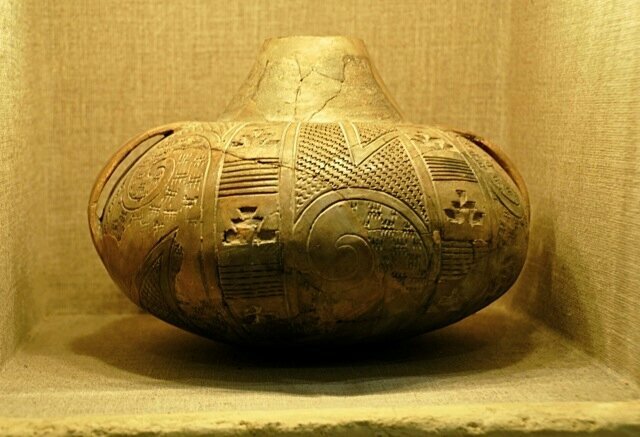 Anthony wrote in his book The Horse, the Wheel and Language, that this type of pottery and patterns was borrrowed by the steppe nomads from populations living further west. I was also amazed at seeing a superb ceramic horse drawn chariot from the Mycenaean period. 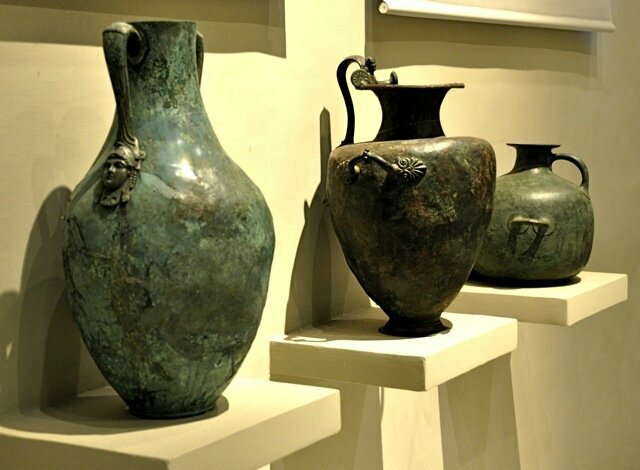 But all the exhibits in the museum looked more beautiful than the others: Hellenic vases in ceramic, bronze or silver, gold necklaces and earrings, marble stelas with painted scenes, earthenware jars leaning against low stone walls as if they had just been discovered. That museum was undoubtedly one of the most interesting I had ever seen. Driving down through Greece, from North to South, from Pelion to Peloponnese to the Island of Cythera, we like to break our journey in Mystras. It is one of my favourite stopping places in Greece. 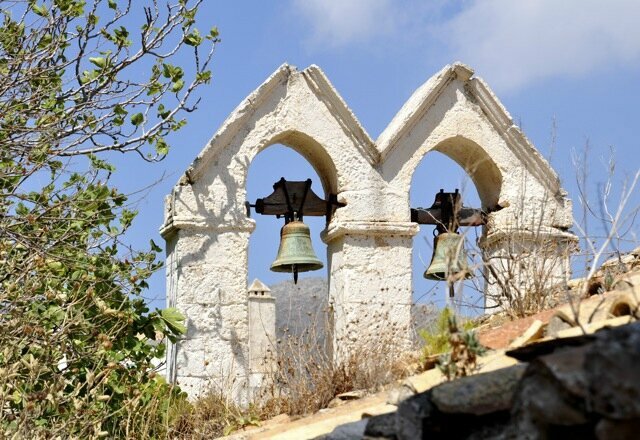 A few miles away from Sparta, on the side of Mount Taygetus, it is a magnificent Byzantine site with a lot of beautiful chapels, churches and monasteries, and dominated by a Frankish castle. But Mystras is also a typical Greek village, about a mile before the site, which has not been denatured by tourism. 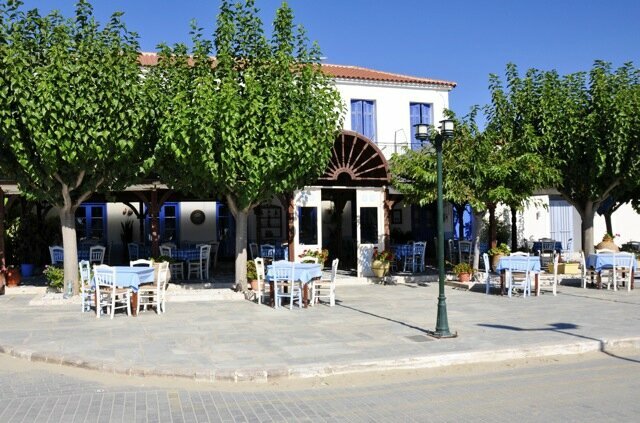 On the central square with its enormous plane tree, you can find the usual tavernas, and cafés where old Greek men are sipping their ouzos - a very quiet place, especially in the morning when the village wakes up. In Mystras we met Porfyra, an icon painter - and a very good one - who keeps the only souvenir shop in the village. She also told us about the very difficult situation of young people in Greece; she spent a lot of money to send her son and daughter to study in the capital. But afterwards they could not get a job: "Why should you study and graduate to earn € 400 collecting the rubbish ?" she said. Her son has gone away to Cyprus where things seem to be better. Today's Sparta is a medium modern charmless uninteresting town, but which can have surprises in store. It has straight streets and avenues, crossing at right angles as in American towns. To drive to Mystras, coming from Tripoli, is rather simple, You only have to turn right in Lycurgus Avenue and follow it to the end. Lycurgus was the legendary lawgiver of Sparta and indeed, on a square in the middle of the avenue, you can see his statue in the form of a young ephebe carrying the tablets of law. But to drive back to Tripoli, it is another story; such a street map may seem easy to follow, but when there are no signposts, you may turn off too soon or too late, go astray and get lost in forsaken suburbs. This is what happened to us, and suddenly, in a faraway district, we fell upon a colossal bronze statue of Leonidas, armed and helmeted, with his sword drawn out in his right hand, ready to attack or defend the Thermopylae against the Persian army. Impressive! 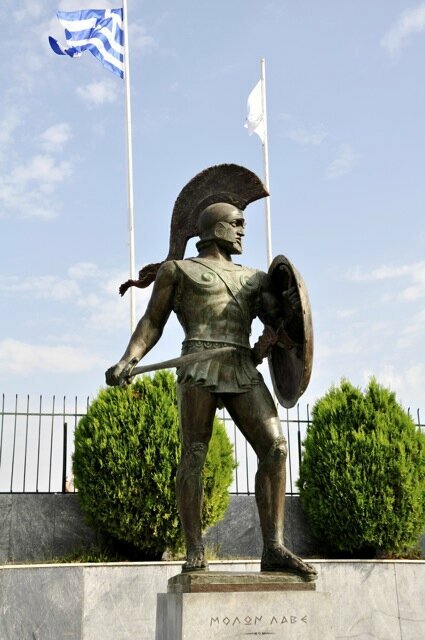 In fact he stands in front of the town stadium of Sparta (dimotiko stadio), defending it against Persian, Athenian or Thessalonian supporters. The motto is engraved on the pedestal: Μολων λαβε "molôn labe", Come take (our weapons), two words that Leonidas is supposed to have replied, in his laconic way, to the Persians who had asked the Spartans to lay down their arms. Driving down Laconia, the province of Sparta along the third south-pointing peninsula of Peloponnese, we reached Neapoli at the very end, where we embarked for the island of Cythera. An hour and a half later we disembarked in the little port of Diakofti. Cythera is the island of Aphrodite, the Goddess of beauty, because, according to the legend, this is where she emerged from the sea. 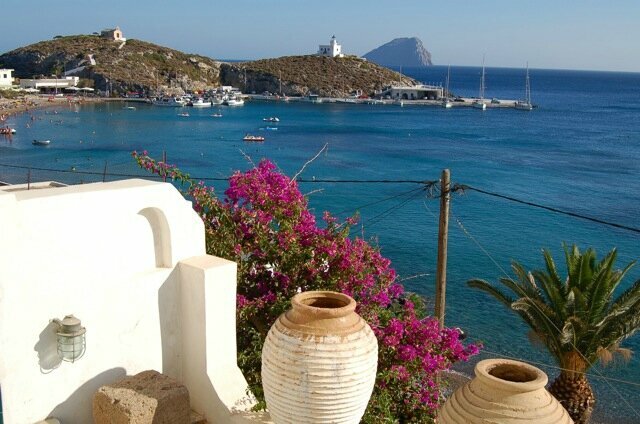 We found accommodation in Aphrodite Appartments of course, belonging to Yanis, a very friendly accountant and his mother in Kapsali a small fishing port with a marina overhung by a rock on which Khora, the capital of the island was built, under the Venetian castle, the kastro. 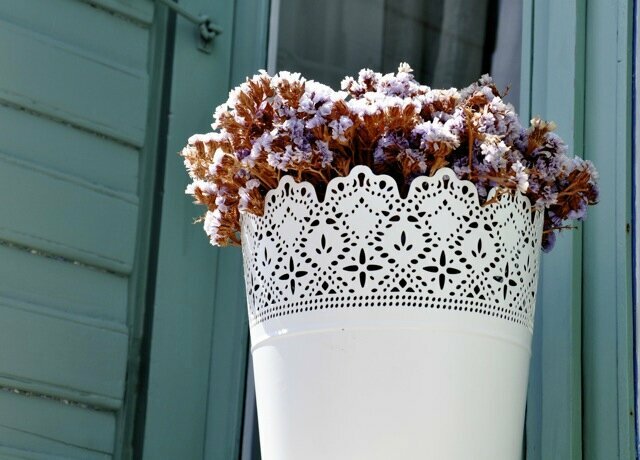 Khora is a charming little town, or rather a village, with its whitewashed houses, its beautifully carved doors painted blue or green, its bougainvilleas and hibiscuses, its enormous jars, its cats and innumerable little chapels. It looks like a Cycladic village lost in the south of Peloponnese, but it is much quieter. There are only 300 inhabitants in winter, and in summer relatively few tourists, compared to other Greek islands and seaside resorts, except of course, around August 15th when all the Greeks take their holidays. The island itself is sparsely populated with only 4000 people. Many Cytherians emigrated to Australia, and some of them come back for the summer holidays; you sometimes see groups of people speaking half Greek, half English: they are Australian Greeks, and this is why Cythera has also been called the kangaroo island. 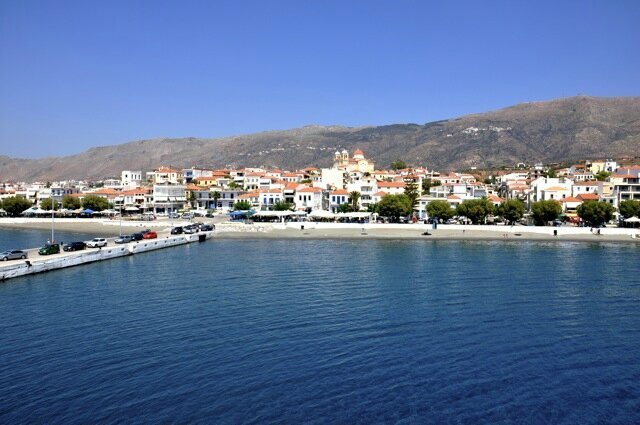 Many sailing boats and enormous yachts of various nationalities stop in the small port of Kapsali; they are Greek of course, but also Italian, English, German, French and Australian. We sometimes also see cruise ships like Club Mediterranée which are much too big to enter the harbour: they drop anchor off the bay and use small boats for the passengers to disembark. Cythera also inspired many artists like Antoine Watteau who painted The Embarkation for Cythera in 1717, then poets like Gérard de Nerval, Hugo, Baudelaire, Verlaine, musicians like Couperin, Saint-Saëns, Fauré, Debussy, Ravel… Bougainville, the French explorer, when he discovered the island of Tahiti, called it "the new Cythera", and his own name was given to the flowering bushes that you can see averywhere in Khora: bouganvilleas. How pleasant it is to take an evening walk in the narrow streets of Khora, drink an iced coffee in the old café Nostos, furnished and decorated with ancient objects and tables like the Greek kafeneia formerly, or sit on the terrace at Zorba's to savour roasted piglet washed down with a pitcher of cold local white wine, admiring the sunset, the village below and the mountains in the distance. A visit to the kastro, the castle is of course a must. It was built by the Byzantines in the 13th century and renovated by the Venitians 100 to 300 years later, on a rock overlooking the Kapsali bay; from there the view on Kapsali, the sea, the rock emerging in front of the bay like Diamond Rock in Martinique, is splendid. Inside the castle walls a small church was built on the edge of the chasm; inside you can see a magnificent iconostasis, but unfortunately the church is often closed. Leaving Cythera and back to Sparta, we decided to visit the first southern peninsula of Peloponnese, between Kalamata and Kyparissia. 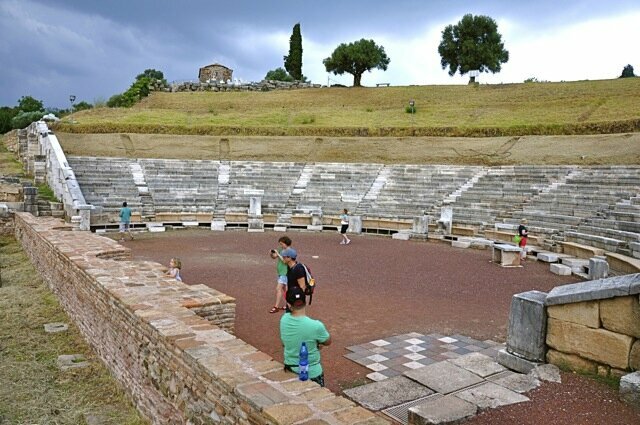 We started with the archaeological site of Ithomi. 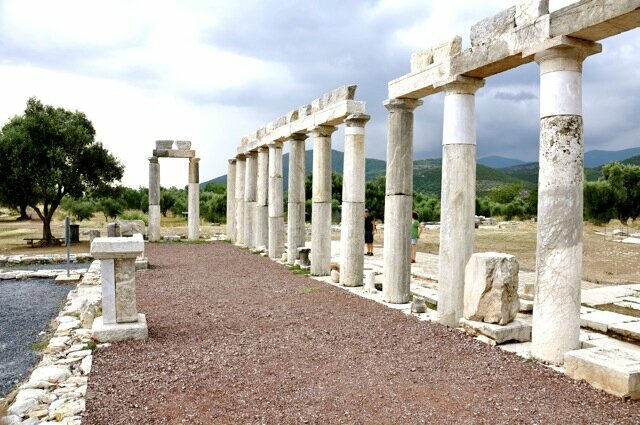 It is Ancient Messene which was built by Epaminondas, a Theban general, after his victory over Spartans in Leuctra; the city was in charge of keeping an eye on Sparta. Apparently ancient Greeks always knew how to choose the most beautiful landscapes to build their cities on hill slopes with a view on the mountains around, as in Epidaurus or Mycenae; the site of Ithomi is as inpressive as that of Delphi. 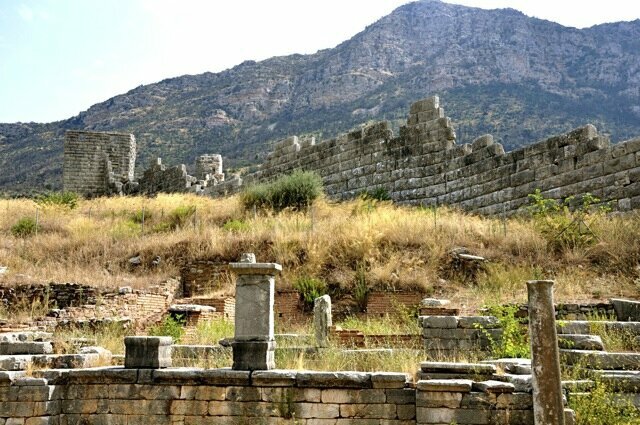 As in Delphi it was build on a slope and is surrounded by wild moutains. Coming from the North, from Tripoli for example, after getting lost on small roads without any signposts, you first arrive at a long defensive wall climing up the mountain, studded with sqware towers. Most inpressive is the Arcadia Gate made of enormous stone blocks fitted together without any cement. Following the road, you drive through it: it has two entrances and an oval space in the middle. Two miles further you arrive at the site; the little museum is not particularly interesting: a few beheaded Roman statues and one of Hermes which is far from being as beautiful as Praxiteles' Hermes in Olympia. On entering the site, dominated by a small church and its churchyard, unlike in Delphi, you have to go down. You first get to a small, well-preserved amphiteatre, then, below, you can see a row of columns, and then it is one surprise after another. At the foot of the columns lies a beautiful mosaic pavement with a geometric pattern, and further on other mosaics represent human and animal figures. Behind the columns you find an architrave decorated with lion heads; further still a marble block with a bas-relief representing a lion too. We could have continued like this when we had our last surprise, an unpleasant one this time: the first big raindrops. Indeed we had seen black clouds piling up above the mountains, but we had thought that the storm would have drifted away over the distant mountains. Instead, in the following 5 minutes, we had to face a real deluge. Fortunately we could find shelter, together with a few Germans and Greeks, under a tarpaulin that had been stretched between three olive trees to protect people from the sun. We had to wait for about an hour before the rain stopped. The Germans started talking together and I talked to the Greeks. "We must be optimistic" I said; I was of course speaking about the weather, but the woman added that they could not be optimistic given the situation in the country. "Isn't it any better than last year ?" I asked. "Oh no, it's much worse" she answered "my husband has been unemployed for ten years, and we have to pay more and more taxes". When I started mentioning the Greek debt the old man changed the topic immediately and said that the rain had stopped. We still had many things to see, but as there were puddles and mud everywhere, we decided to leave and head for Kalamata. A touch of optimism however: we had noticed that they were building new roads or repairing old ones in many places, like the new motorway between Sparta id Tripoli, for instance, that opened only three months ago; maybe this road building created new jobs. 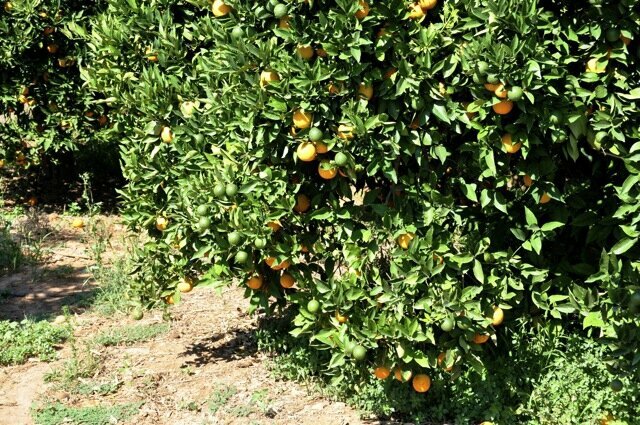 Along the road between Kalamata and Koroni, there are many rich villas with beautiful gardens, and Koroni itself is a small port with narrow streets which, in spite of the weather, was full of tourists. In the mountains between Koroni and Methoni, we had another thunderstorm: it was raining cats and dogs and water was streaming down the mountains carrying earth and stones on the road, but we did not stop. Only later, drawing near Methoni, did we find a bright sunshine in an azure sky without any cloud. I did like Methoni a lot, a quiet little town dozing in the late afternoon heat that had remained very traditional, typically Greek. Hotel Castello is run by an old lady, who, when you speak Greek to her, answers in a strange gibberish mixing English words with other dubious languages, and her even older father. The place is very pleasant with a nice garden where we can have breakfast. 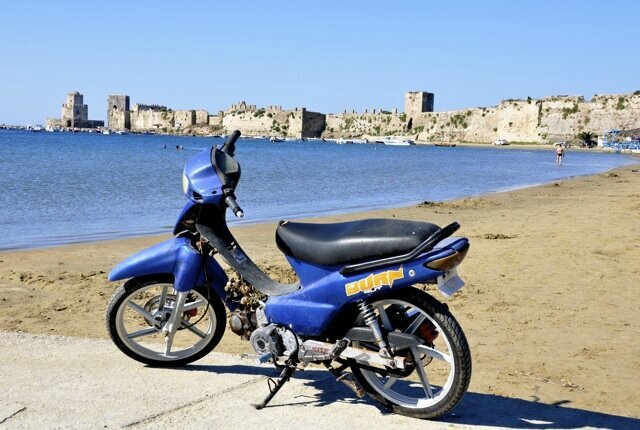 Unlike in many other Greek towns and villages, in Methoni the main square is not in the town centre, but on the sea front near the beach, with its usual tavernas and cafés. The streets leading to the square are straight, lined with flowering hibiscus shrubs. The beach is also particular, bordered on the right by an immense Venitian fortress to which the Turks added a small fort, and on the left by a pier where the fishermen's boats are moored; some of the fishermen live in small houses in front of the beach. After Methoni, we drove along the coast heading for Patras, our port of departure. The west coast of Peloponnese is devoid of interest. Apart from Pylos, the ancient city of old Nestor, which is relatively pleasant, we drove through charmless towns like Kyparissia or Pyrgos; the only good surprise we had was to find a good copy of the Eiffel Tower in Philiatra, a small town before Kyparissia. We did not want to finish on such a disappointment so we decided to spend our last Greek evening in Olympia. Hotel Neda is a very pleasant 3 star hotel with comfortable rooms, a swimming pool and a panoramic restaurant with a terrace. At the reception, we met the director's son with whom we had a chat in Greek. He said the same as the other Greeks about young people who are without hope and have to leave the country to find work. He also said that the Greek and French peoples are friends; the owner of a leather shop said exactly the same and spoke of Pierre de Coubertin. It is true that during and after the 1821 Greek revolution, France was one of the rare powers supporting Greece without any ulterior motives, but I am not sure that we are supporting Greece today, or else very timidly, in spite of the fact that there are many French tourists visiting Greece and who like that country. How can we conclude this sequence of images, impressions, encounters, emotions ? Everything is ambiguous. 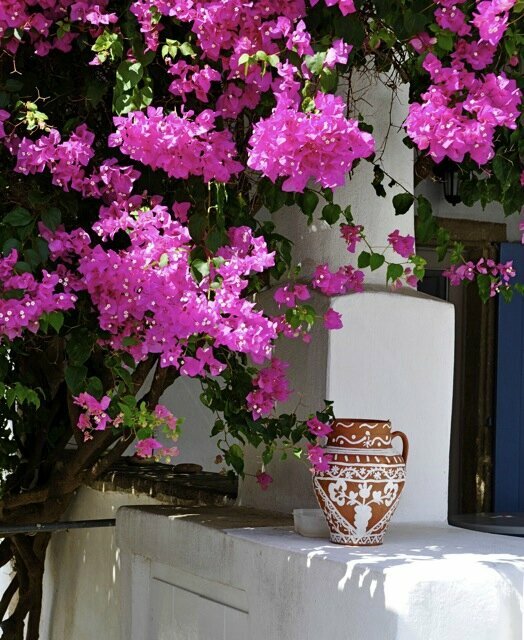 On the one hand Greece is eternal, in the summer for the tourists nothing seems to have changed: it is always beautiful, warm and welcoming. On the other hand, when you talk with Greeks, you understand that the situation is catastrophic. Three million Greeks, nearly a third of the population live miserably, under the poverty line. Many Greeks have no social welfare and no money to buy medicines. But I would like to finish on an optimistic note, a glimmer of hope. The Greek people is a strong people who went through terrible situations before like civil war and dictatorship and has survived. In Lesbos where Elisavet, our friend Yanis' sister lives, people have nothing and yet they welcome and help the Syrian refugees: they have nothing and yet they give. As a guest in a recent TV programme on LCP (the Senate's channel) said: today Greece is showing Europe what the real European values are: humanism and solidarity.